When links are posted to social media sites, many (most? all?) add some sort of featured image. 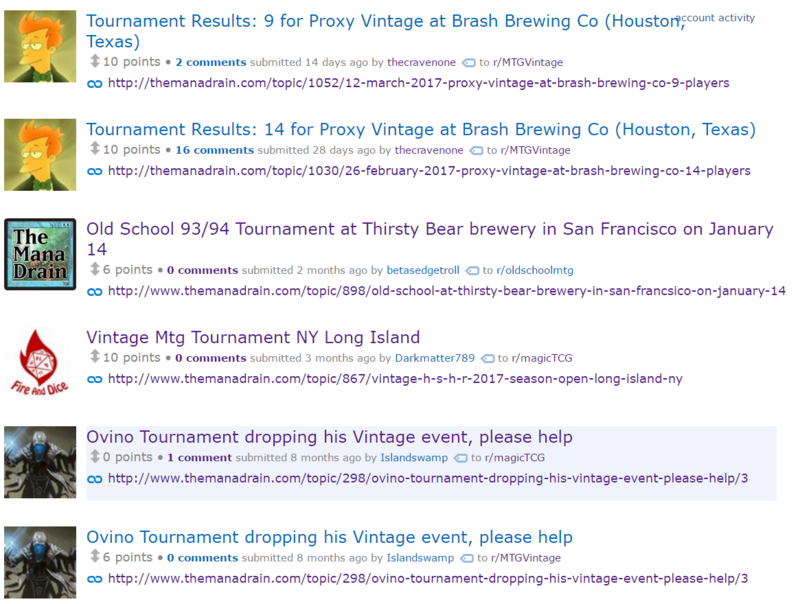 Currently, across all sites that I use, that image is the avatar of the user who posted the post that is linked to. It appears that it is not the first image in the code that these sites display but rather the first image that is actually rendered in the view port. 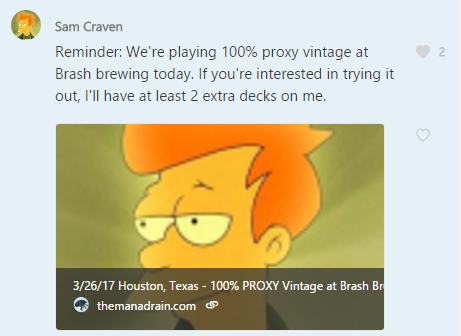 For example, one of those Brassman tweets is a link to one of his posts further down the page and shows his avatar, not the original poster's. I admit that this is a very small thing and some sites even have a workaround. For example, if you upload an image with your tweet, that image will be displayed rather than the page preview. 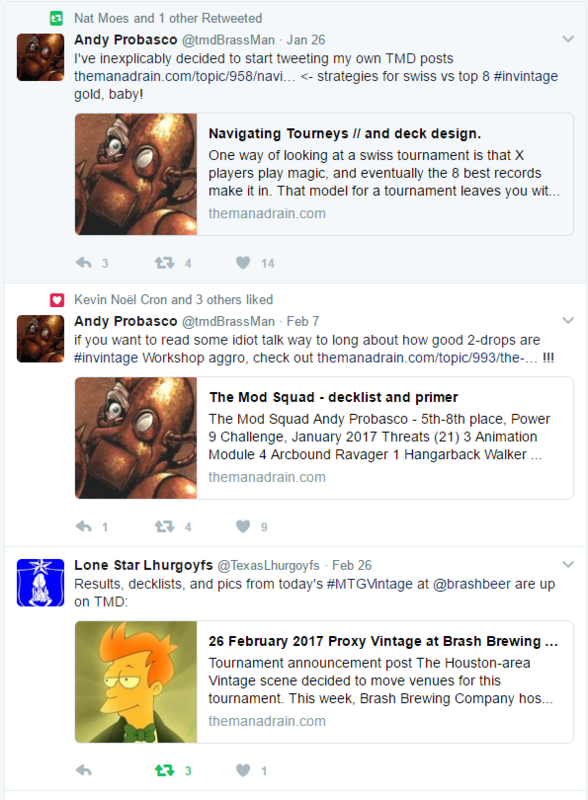 Association - If I'm posting an announcement that my LGS is hosting a tournament, they don't want their tweet to have a picture of Fry showing up in their posts. This may encourage TOs to open separate accounts for their event postings. Indeed, I have been considering creating a new account for posting tournaments held by my LGS. Confusion when the displayed image is significantly different than the text. For example, if user Tropical_Island writes a post about how Underground Sea is the best dual land, the image displayed will be his avatar, a Tropical Island. Quality - As is most evident in my GroupMe snapshot, these small avatars sometimes get blown up, making them look bad. Especially in the case of a business, I'd rather not have my logo looking like crap in my social media posts. If these sites are indeed defaulting to the first image in the viewport, simply having a visible logo in the header should result in that logo being used for the image preview. Add code to the site to automatically specify an image. I know Twitter allows this, so I would imagine that the other big sites would as well. Having the first image in the post be the featured image would be fine. Allowing the user to specify their own featured image would be better. I'll do a bit more research on this today and post my findings. Any feedback on other ideas is greatly appreciated! A Twitter friend has pointed out that this should be relatively easy to resolve using Open Graph Protocol. yup, OpenGraphProtocol is how Twitter gets that image, unfortunately the default forum software has some ... let's say "interesting" ideas about how to decide which images to use. It'll take a little digging to fix, but I agree that this is something worth fixing. Well now that I know that you're open to the change, I'll dive into the code a bit myself as well!